My mother said she was house proud and that she was going to have to pay for that when she went to heaven. She had an image of heaven as being like a baseball stadium and the better you were the closer to home plate you sat. Things you did could cause you to be assigned to the nosebleed section. She thought for sure being house proud, along with eating too much chocolate and using the Book of Common Prayer (Episcopal) rather than free form like the Baptist would do it. Nonetheless, the latter two, paled in comparison to being house proud. These are the actual parts that are arriving. The clock was $6. 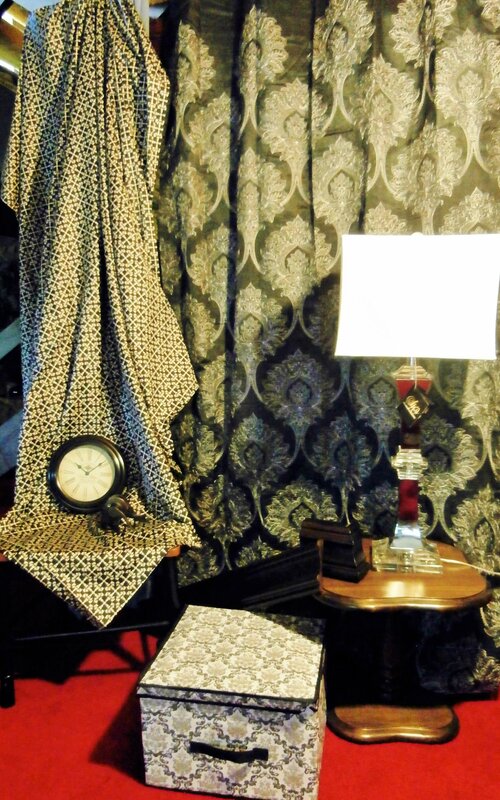 The paisley box is a designer piece that cost a good deal more but is a “statement” piece for the room. Turns out house proud is in the dictionary. The Free Dictionary defines it thusly: proud of the appearance, cleanliness, etc., of one’s house, sometimes excessively. I don’t suppose she ever looked it up in the dictionary but perhaps she did. I agree with her, she was house proud. And, it seems to be hereditary. I am house proud. With me the excessively part really fits. In fact, you could shift that to obsessively and you would be closer to me. When we were on our cruise last week we took two classes in wines. The first was interesting enough but pretty basic. The second tasting was a couple of days later and I could tell it was going to be different the moment I walked in. The place-mat with the info about each wine printed right under a circle for the glasses there. What was different was the plate of food by each person’s wine glasses.The food was gorgeous to look at; it has been prepared so nicely that it alone was a treat. Cheve, pate in brochette, portebello mushrooms, medium rare duck breast fresh pear and a chocolate cake of some sort soaking in a pool of thin delicate chocolate sauce. It was going to be a class in wine parings,a class in how you match a wine to food. I am actually good a wine pairing. I have an acute sense of smell so I can pick up the inner-workings of wines and spices and meats and vegetables and figure out ways to make them a happy group. Like a lot of us who are aging, I take medications that don’t mix well with drinking. I have learned to “drink” my wine by smelling it. I drink some but I have grown to truly appreciate smelling wine. The aromas can be lush and satisfying. When my spouse goes to the wine cabinet and says, “What are we having for dinner tonight? I was going to pick a wine.” I respond with, “I don’t know. Pick something you are interested in and give it to me so I smell it so I can cook something to go with it.” I never thought much about this in the past but after the class I realized that I was pairing based on the smells of the food and the smell of the wine. In the class we were invited to taste food that would go well with the wine and food that would either destroy the taste of the wine of be destroyed by the wine.The interesting thing that the Cellar Master said was that they “Taste a wine and we memorize it so we can know what food to pair with it. That is exactly what I have been doing while gathering things for this house we are working on. I have an idea and memorize it and then when I something that fits with it I try to procure it if it makes budget sense. It is interesting to do.You hold an image and then wait for the sales that come up with only 15 minutes or something like that while you judge the importance of the piece in the scheme of the whole house. You must pounce or not get it. Not getting it is just like not having it which is not a big deal. However, having found and brought home or had delivered a new part of the picture is exciting. It is also importance to see how the whole fits together. When you are lucky, it all fits and your vision com to life. In a gift like a heady wine, today those things fulfilled my expectations and my hopes. Because we have a specific amount of money from the insurance company we need to work within a specified budget. 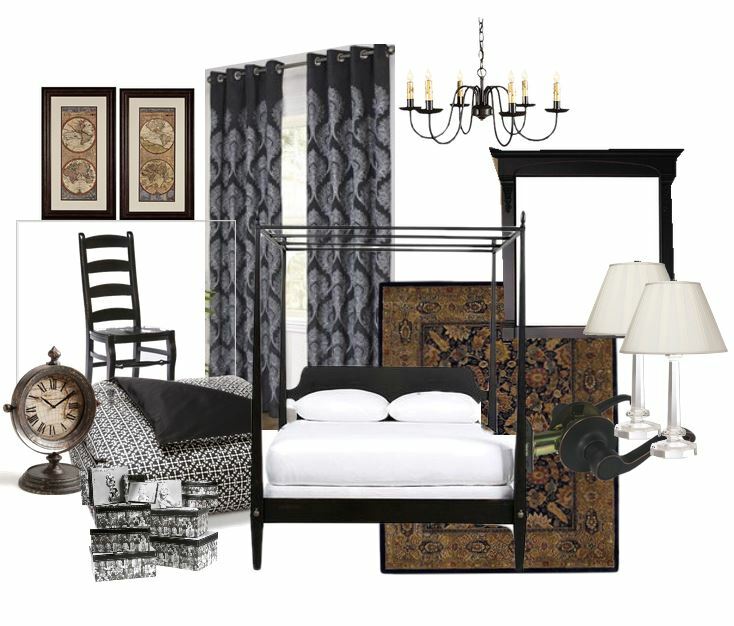 I am constantly on the e-prowl to find stuff that fits and will be within budget. From my mom, and my own house proud experiences house proud I know that you can use a lot of inexpensive things if you position a few expensive things correctly. Because I am purchasing things like I would buy food to pair with a wine I am not always sure what will go with what and what is so cheesy it would wreck the room. My house proud self was giddy with delight today. The things I bought at online outlets and second hand did come together. The room will bring pleasure to those who visit and stay there. I got it right today. My food did not kill my wine and my wine did not kill my food. They were in balance. It seems to me that if you solve a puzzle and you share with others, you are doing something right. I suspect I won’t have to sit in the nosebleed section. 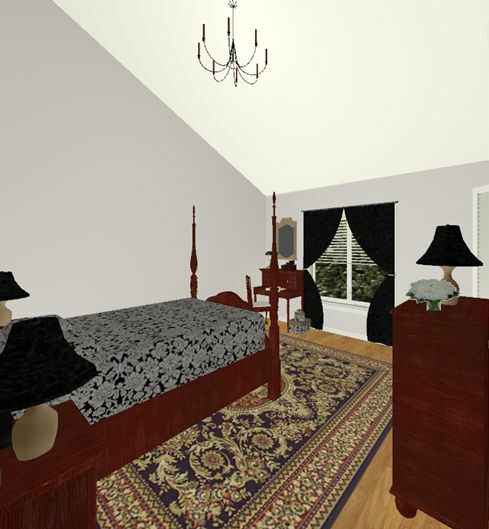 The 3-D mockup of the upstairs guest room. A montage of the materials used or samples for which I am seeking a cheaper one. The things that have been coming in for the past few weeks.